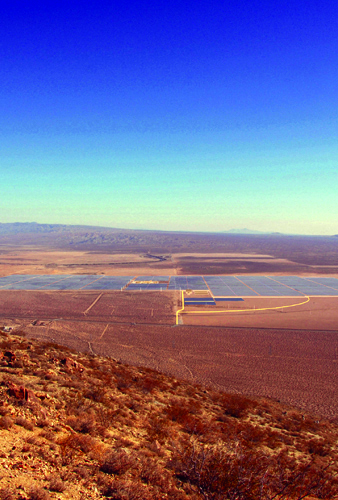 Aspen assisted the California Energy Commission (CEC) with the Staff Assessment for the Beacon Solar Energy Project. As well as providing the CEC Siting Project Manager, the Aspen Team was responsible for the evaluation of Water Resources, Biological Resources, Cultural Resources, and Geology and Paleontology. Beacon Solar, LLC proposed to construct a concentrated solar electric generating facility on an approximately 2,012-acre site in Kern County, California. The project has a nominal electrical output of 250 MW and uses parabolic trough solar thermal technology to produce electrical power using a steam turbine generator fed from a solar steam generator (SSG). The SSG receives heated heat transfer fluid (HTF) from solar thermal equipment comprised of arrays of parabolic mirrors that collect energy from the sun. The project utilizes two auxiliary boilers fueled by natural gas to reduce startup time and for HTF freeze protection. The auxiliary boilers supply steam to the HTF freeze protection heat exchangers during nighttime hours to keep the HTF in a liquid state when ambient temperatures are not sufficient to keep the temperature of the HTF above its relatively high freezing point (54 degrees Fahrenheit). In order to fuel the boilers, a new 17.6-mile, eight-inch gas pipeline would be constructed to connect the project to an existing Southern California Gas Company pipeline in the California City area.